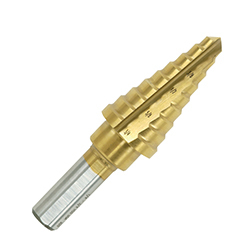 Titanium coated step drills are designed to handle repetitive drilling in metal, wood, plastic and PVC. The titanium coating is engineered to last six times longer than standard high speed steel bits. Specially designed to automatically debur holes as it drills. A balanced double flute design minimizes chattering.